When Canon released the original EOS 6D, it started the movement of having a beginner’s camera with a full-frame system. Nikon was also following the same concept with the D600. Of course, the value of the camera was all due to the size of the sensor. But once Canon launched the EOS 6D Mark II, it was a bit of a letdown. Majority of its upgraded features are based around its tech but only made it up-to-date with other Canon series. So nothing new was brought to the table. With the camera industry booming, DSLR cameras facing tough competitors especially with Sony’s full-frame mirrorless cameras that are also entry-level. Even with the many cameras to choose from, the 6D Mark II shouldn’t completely be dismissed just yet. For the right photographer, it can have some appeal and with the price point, it is still a camera to consider. The blueprint of the 6D Mark II is similar to the original of the 6D. It has the full-frame DSLR structure for those who are photography enthusiast but still want to budget. It will allow those to still capture the quality of a 35mm sensor without much complication of the 5D camera series. As for professional, it won’t be a first-pick but the 6D Mark II can still perform at a high level due to its build and incredible image quality. The build of the camera has been slimmed down but still has a bulky feel with its grip. The grip can cause your hand to become uncomfortable but that might be something you will need to get used to. It is also weatherproof as it has robust protectors over its ports and around the battery door. 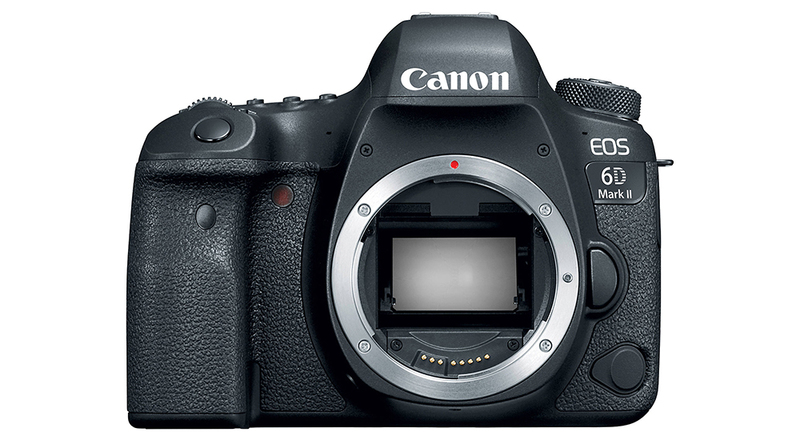 Looking past the exterior, the 6D Mark II functions around the Digic 7 processor and a 26.2MP sensor. If you compare the sensor to the original 6D, this one has a 6MP improvement. Not only that but it has an upgraded ISO capacity of 40,000 which is higher than the 5D Mark IV’s 32,000. You can extend the ISO to 102,400 if needed. The burst rate also improved with 4.5fps to 6.5 – just a bit slower than the 5D Mark IV of 7fps. Canon has been using Dual Pixel Autofocus in other models, like the EOS 77D. Since the company has used the feature before, high performance was expected but that wasn’t the case. Specifically for moving objects. The Dual Pixel Autofocus struggled as it was inconsistent but without a doubt, the subject gets clearer as it gets closer. Even if you put the camera in different modes, the quality is not up to par and depending on the mode, some photos will turn out worse than others. The 6D II has both WiFi and Bluetooth available through the Canon app. This allows a fast pairing with either an Android or iPhone but you will still need to manually connect to the WiFi. With the app, you can take a look at the photos and transfer images from the 6D II and also use it as a remote control. When it comes to the photographs the 6D Mark II captures, there isn’t much to complain or emphasize. Not necessarily a bad or good thing. You can expect the camera to perform well and with a 26MP resolution, images come out incredible. But something that impacts the quality of these photos is the lack of base ISO dynamic range. This means the amount of detail the sensor captures from shadow to highlight without blowing out the darkness and light. With a greater dynamic range, one has more control to recover details in post-production. When there isn’t enough dynamic range, dark subjects will look noisy due to the boost of light. Regardless of the lack of dynamic range, the camera still performs well and is held up at a high standard with still photography. It is considered as Canon’s cheap full-frame cameras and although it doesn’t call to professionals, it can produce the same quality with some assurance. For those who are familiar with Canons, it is definitely easy to use as the control have the same layout of the pro-level models making it a great backup camera. As mentioned, there isn’t a wow feature of the Canon EOS 6D Mark II. Its pricing might be the forefront motive to buy the camera but that’s about it. That’s not to say that the camera is terrible or Canon did anything wrong, it’s just that it has become another camera on the market. With the progress of the camera industry, this model can be the perfect example for Canon to step up their game when it comes to releasing new cameras. But it wasn’t even with this camera were the stagnation started, it was the 6D that also didn’t have a wow-factor to it. Overall, the 6D Mark II is a classic DSLR that will give you what you are looking for but on a budget. Previous Post« Previous Should You Swap Your Nikon D750 for a Z6?